A Local Event Sponsored by Local People! 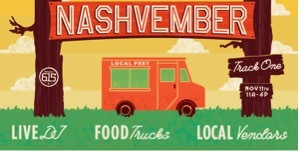 This month we will be at Nashvember, where local small businesses and local food trucks come together and share their story with Nashville! The event is organized by Project 615, a Nashville apparel company dedicated to helping the homeless in our community and other great causes. The event will have over 60+ vendors, including Cul2Vate! Where: The event will be held just south of downtown Nashville at 1211 4th Ave South, Nashville, Tennessee 37203. It is the Track One event space. Why: A portion of this year’s proceeds go to help a local nonprofit, People Loving Nashville!